54 years ago you were born the gifted child of unwilling parents; midwifed by colonial imperialists. Your birth was heralded by so much fanfare. Even though you were born on no manger, you were touted to be the messiah of the African race. The DNA of greatness in you has always been as conspicuous like the shimmering light on a dark continent. It was the envy of our brother countries and a threat to the colonial imperialists who reluctantly bade us farewell. How is it then that 54 years later, the talk is still on about that DNA of greatness yet to harnessed; that potential yet to be maximized? Independence is a word used loosely on every anniversary of yours and it saddens me for all year round, we are stunned with glaring evidence that slavery yet abounds. You are likened to the gifted child nurtured for greatness by well-meaning parents but derailed by the greed of your extended family who have refused to let you be who you are meant to be. The golden eggs you lay has become the cause for your incarceration. These extended relatives, stakeholders, cabal and the like have employed all manner of uncouth tactics to keep you from being what you should be; from where you should be. They have sold you off to foreign interests in order to continue to luxuriate in the wealth of your sweat and blood. Still I believe in you; I believe in what you can and should be. I believe that someday, you will take up that exalted seat that has been prepared and reserved for you from time immemorial. Your past and present betrays hope for the future to the disillusioned eye but something stronger exists deep within you; an unignited spark of brilliance that came to bear when we were plagued with the threat of a devastating epidemic of dubious origins. In that moment of danger, the slumbering strength of your spirit came alive to the chagrin of your detractors. You have experienced trying times and still will dear Nigeria but by the sheer will of that DNA of greatness in you, you have remained firm and resolute to survive. You have continued to show promise in the dream of a greater tomorrow. Your past may be tainted with the blood and tears of the innocents but that untapped potential is always a reason for us to believe. I know we cannot change your past, but as the river keeps flowing, you must keep moving knowing that every river has a destination. 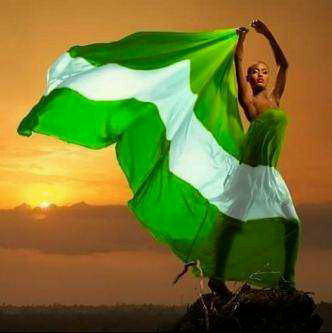 I love you Nigeria and I always will. The people called by your name. As usual…wonderfully thought-up write up. apt! That seed of greatness, I mean that seed of greatness in Nigeria that has been perennially masked by a visioneless leadership system must be realised and the time is NOW! Beautiful piece.